Hadley Galvan of Archbold goes up for a shot and draws a foul Tuesday during a non-league game versus Fairview. The Blue Streaks fell short to the Apaches, 52-47. Harley Phillips of Archbold fires up a three-pointer Tuesday against Fairview. 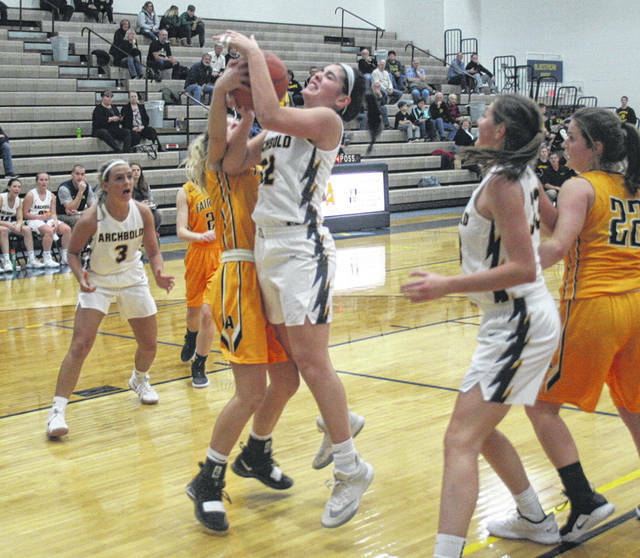 Archbold held Fairview without a field goal in the final five minutes of the contest, but it was not enough as they could not overcome a big deficit in a 52-47 loss at home in non-league girls basketball Tuesday. The Apaches led 40-27 after three quarters, and that margin only increased in the early minutes of the fourth quarter. Fairview’s Kiersten Cline knocked down a pair of baskets to open up the final stanza. Sophie Hubby and Lily Krieger each hit a pair from the foul line for the Blue Streaks around a hoop from the Apaches’ Mercedes Wagner, making the margin 15. Fairview then tied their largest lead of 17 points when Cline cashed in on a fastbreak opportunity to make it 48-31 with 5:05 left. However, at that point the Streaks began to chip away. A Gabby Nafziger corner three-pointer started the rally with 4:41 to go. The Streaks then got a combined 3 of 4 free throws from Krieger and Hubby, plus a bucket by Faith Wyse which cut it to 48-39 with 1:44 to go. 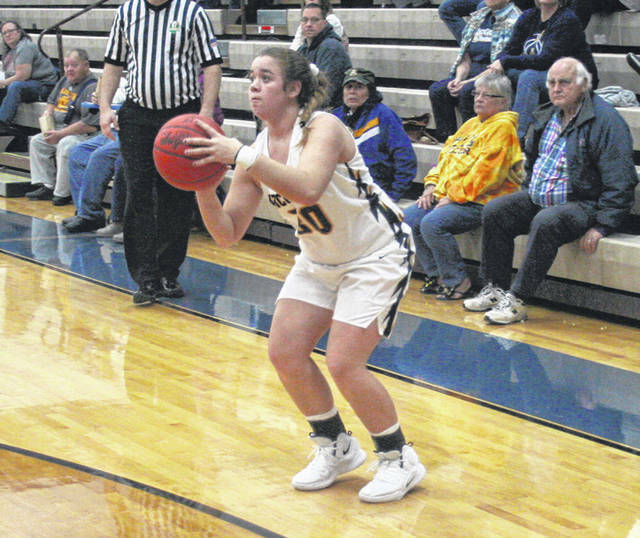 Krieger followed with a three-point play 15 seconds later, then they took advantage of consecutive missed opportunities on 1-and-1’s by Fairview. After the Apaches came up short at the line, Hadley Galvan hit two for Archbold to make it 48-44. She would nail two more from the charity stripe following an Apache turnover, pulling the Streaks within a deuce with only 24 ticks to go. However, the Apaches were able to get to the foul line the next time down as Olivia Ricica converted a pair. After an Archbold giveaway, Michelle Marshall hit two free throws to seal the win for Fairview. In the opening quarter, Archbold broke an early tie to lead 6-2 after a bucket from Wyse and Krieger’s jumper. Ricica then split a pair from the line and Kendall Baker buried a three from the corner to knot the score at the 3:17 mark. The two squads would trade baskets before a Ricica putback gave the Apaches a 10-8 lead after one. They maintained the lead from that point on. Krieger paced the Streaks with 21 points. Ricica scored 19 for the Apaches and Wagner tacked on 14. Archbold (2-2) stays home Friday when they welcome Edgerton.